I'm surprised she survived the 2004 haul-out (the middle photo) in one piece! Well done Mr Fisher for buying her in these tough economic times, judging by the list of work she appears to have had done on her since 2004 she seems to be a bit of a bargain despite the stolen bits. Unfortunatly scrap theft due to recent high scrap values is not just British thing it has been happening in New Zealand of all places. An historic boat with a famous previous Owner has to be a good buy bearing in mind today's "performance" diesels may not have existed without the Ricardo tuning eye/hand upon them, even the German V.A.G cars use his tuning principles, a truly great Engineer. What does Christian think was wrong with the 2004 lifting arrangement? Quote. 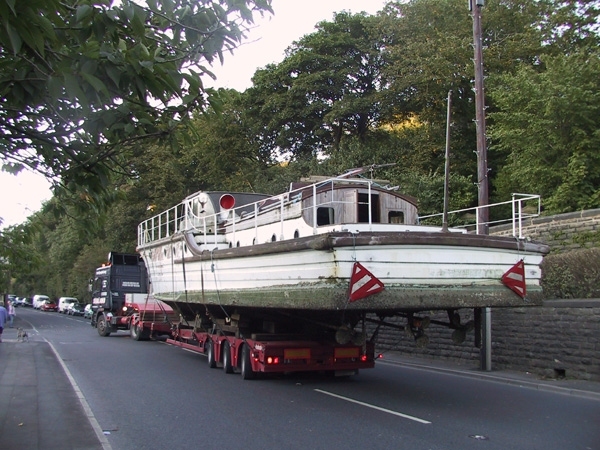 "Experts at the British Military Powerboat Trust feared no-one would come forward to tackle the refit of the fast pinnace." I only heard about her from seeing the boatsandoutboards advert a couple of days ago, how long had she been 'up for grabs? I nearly gave Andrew a call! Hello. What an excellent resource this forum is. I have recently purchased "Caprella" R.A.F. TRSV 421250 (Torpedo Recovery and Safety Vessel) and will soon be beginning her restoration. As you may have seen from the BTX website, she has suffered badly at the hands of vandals who stole her props, shafts, "P" brackets and most of the copper sheathing from her hull. Her hull and superstructure seems to be in good condition. Caprella is now fitted with Y6 Perkins 6 cylinder diesel and Newage PRM 500D2 Gearboxes, but her twin Dorman Ricardo 8VRM engines and gearboxes are still with the vessel. I have amassed quite a wealth of historical information already, a summary of which is below. I would be very grateful for any further information or photos anyone could add. 1943 Built by Groves and Gutteridge Ltd on the Isle of White. Originally intended for service in the Far East she worked as a torpedo recovery boat for the RAF in Portland Harbour for the remainder of the Second World War. Purchased by Sir Harry Ricardo from the Admiralty at a small craft disposal sale and named “Caprella”. Many modifications designed and constructed by Sir Harry including replacement of the central engine with a more economical 24hp Dorman. Laid up every winter at Shoreham. During summer months based at Itchenor in Chichester harbour. Voyages to Isle of White or around Chichester and Langstone harbours. Longer voyages each summer with larger parties to Devon and Cornwall. At Spithead for the 1953 review. 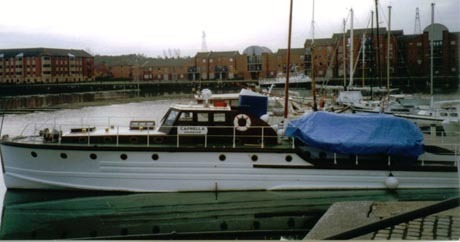 1958 Lloyd Register lists home port as Shoreham. 2009 – Current - Andrew Davidson, Aberdeen. According to the RAF Marine Craft Directory TRSB 421250 was built by Watercraft at East Mosely, completed 23.05.44 under contract number CP 77549/42 (and was not ex-RAF) and was laid up for disposal 17.04.46 on the Hamble. Thanks for the welcome Johnk and thanks for the information Christian. Would be grateful if you could tell me which volume of the RAF Marine Craft Directory you are referring to - I'd like to buy a copy. One of these craft is moored on the Rio Guadiana this river forms the border between Spain and Portugal. She is moored just above the village of Alcoutin a ferry runs across to Sanliucar de Guadiana on the spanish side. I have a photo of her taken this year, she is in poor condition topsides, the rear cabin has been enlarged and looks rather large and out of keeping. In the 1960's Billy Cotton had one as a motor yacht. Moored on Princess Pier near our berth he used to complain we woke him up in the mornings. Guess what it was called. Wakey Wakey !